Services - Harald's Small Engine, Inc.
We work on all small engines, generators, chainsaws, trimmers and all lines of lawn and garden power equipment. We take trade-ins on all equipment, buy, sell and trade for most anything!! 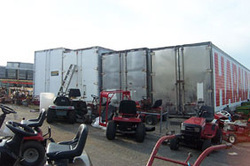 We have a large stock in these storage trailers of automobile fluids i.e. motor oils, diesel conditioners, brake fluids etc. We have many different kinds of car care products i.e. waxes, polishes, shop towels, floor mats, carpet cleaner and miscellaneous auto parts. Practically anything you might find in an automobile store, we carry at HALF THE COST! 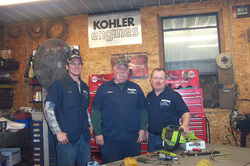 We have many used and salvaged small engines, chainsaws and weedeaters for parts needed. We have recently purchased a HUGE selections of all types of nuts, bolts, screws and washers!